The Room may be turning 15 years old, but right now — it’s bigger than ever. 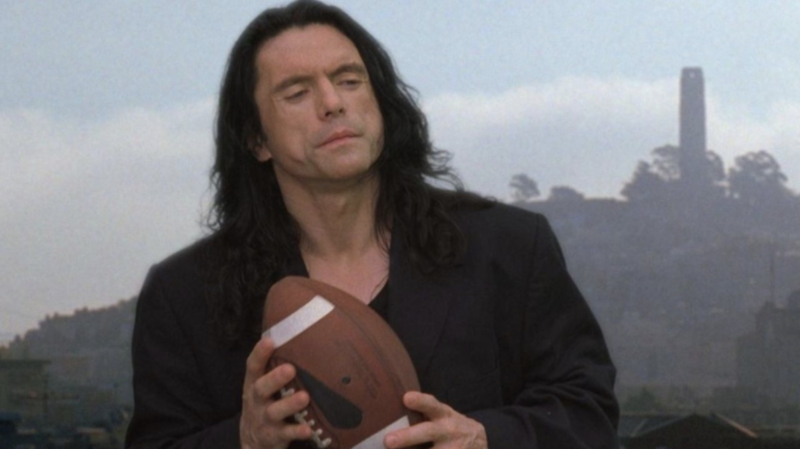 Thanks to The Disaster Artist — James Franco’s critically acclaimed film about the making of the best-worst movie — the 2003 film and its enigmatic writer, director, producer, financier, and star, Tommy Wiseau, are finally the stars they set out to be nearly two decades ago. Based on The Room co-star Greg Sestero’s book of the same name, The Disaster Artist follows aspiring filmmaker Tommy Wiseau as he pursues the passion project of a lifetime — and sinks a reported $6 million of his own money into the project. While The Room was an immediate flop after its release, it developed a cult status as “the Citizen Kane of bad movies” and continues to be shown all over the world. There’s even audience participation at screenings — in which attendees dress up like their favorite characters, throw footballs and spoons, and recite lines back at the screen. After seeing The Room and The Disaster Artist, you’re *definitely* going to be curious about Wiseau’s additional forays into the film industry — and yes, he’s still making movies. From his first projects following The Room to his upcoming on-screen reunion with Sestero, we’ve rounded up six essential projects to watch for the Tommy Wiseau fans out there. In his most extensive creative endeavor since The Room, Wiseau created, wrote, and stars in this apartment sitcom. Wiseau initially shot a pilot episode in 2007 but the episode never made it to air, with just the above trailer remaining. Despite the failure of the initial iteration of The Neighbors, Wiseau kept developing the sitcom and in 2015, six episodes were released on Hulu. While no longer available on Hulu — Wiseau later told Splinter that Hulu released the six-episode first season in order to maintain Emmy eligibility — The Neighbors Season 1 *is* available on DVD, with a reported Season 2 on the way. Tim Heidecker and Eric Wareheim, comedians and massive fans of The Room, invited Wiseau to guest star and direct an episode. It went about as well as can be expected but seeing the befuddled amazement on Heidecker and Wareheim’s faces while working with the eccentric Wiseau is spectacular in and of itself. Wiseau teamed up with sketch comedy troupe Super 8 for this 2010 comedy-horror short film. With Wiseau pulling double duty as The Stranger and Alex, the short is a scary story within a scary story about, yes, a house that leaks blood. Wiseau re-teamed with Super 8 for this bizarre series following the filmmaker, playing a (probably) fictional version of himself called T.W., who is repeatedly kidnapped by aliens, sent to a moon base, and is forced to play video games. The entire series is currently available on YouTube for the Wiseau super-fans out there. Wiseau played Linton Kitano in the 2015 sequel to the 1991 direct-to-video action film about Samurai cop in the LAPD tasked with taking down a notorious gang. The film was crowdfunded using Kickstarter and even had an accompanying documentary called Enter the Samurai. Now this is a film that’ll *really* have The Room fans excited as it reunites Wiseau and Sestero on-screen for the first time in nearly 15 years. Reportedly inspired by a real road trip taken by the duo in 2003 and written by Sestero, the film follows a man who encounters a mysterious mortician (Wiseau) who takes him on a life-changing adventure. A rough cut of the film was shown at the Prince Charles Theatre in London — a venue known for regular screenings of The Room — earlier this fall, but an official release is reportedly slated for next year. Additionally, Wiseau has a small cameo in The Disaster Artist, which is currently playing in select theaters.